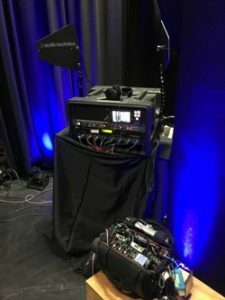 I’ve been building a rig capable of covering a music event and the BTS elements of the performers in a seamless way. This is the first time I have begun to see that potential. During this surprise car giveaway to a cancer patient by Don McGill Toyota, a day of ENG, a radio interview and appearances culminated in a secret attended performance by Justin Furstenfeld. At the end of the evening they gave away the car. Three rigs were in play. A Sound Devices 633 and Lectrosonics package had all the lavs and handhelds in play iso recorded. A Pix 260 recorded the audience mics, all the wireless mics in and a PA feed. The digital PA system recorded a multitrack capture of the stage elements. This entry was posted in Advertising, Auto, Location Sound, Music Recording, Social Media, Web Audio and tagged 400 series, Auto, Blue October, Campaign, car, Car Giveaway, Don McGill Toyota Houston, eng, Fountain Forward, houston, ifb, Justin Furstenfeld, Lectrosonics, Live Music, Live Performance, location audio, location sound, Moffett Productions, PIX 260i, Radio Interview, Social Media, Sony FS7, Sound Devices, Sound Devices 633, texas, Toyota. Bookmark the permalink.